This striking statement seems to capture the very essence of He who speaks it. His utterance appears to invite us into not only openness but also oneness, unity and perhaps even into the mystery of what is called the Kingdom of God or the peaceable kingdom of Isaiah. Leloup says that Openness, 'as the least blasphemous name for God', is the 'Infinite Space within the very heart of space, containing all and contained by nothing'. As unexpected as it may seem the traditions that have sprouted up in response to the life of Jesus direct us, at least in part, towards his capacity for openness. We are not simply to observe or imitate this openness but embody it even through our limitations, resistances and hardships. I remember a Friend telling me that at a certain point in her journey she had simply decided 'to be open'. This meant that she would be open to spiritual wisdom no matter its source and how it came to her. This did not mean an abandonment of discernment or reflection but taking the time to attend to what had been given to her. How common it seems for writings of a theological or spiritual nature to explore how we can open up. Further along in the same logion from the Gospel of Thomas Yeshua indicates what follows from openness in contrast to division. When disciples are open, they are filled with light. When they are divided they are filled with darkness. 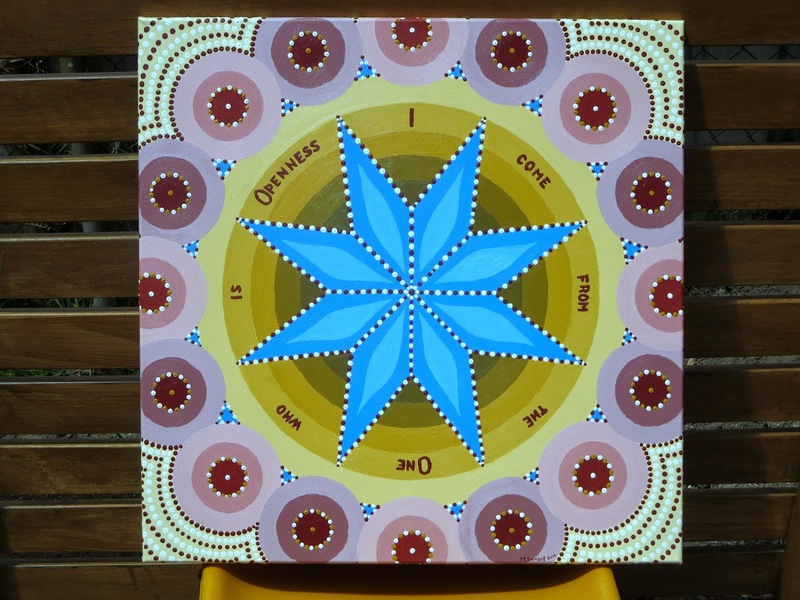 In the painting the eight pointed star contains eight diamonds to indicate that openness expands awareness in all directions seen and unseen. This radical openness seems to carry the quality of immensity. One small glimpse is enough to sense its potential. May you be well. May you be open and at peace.